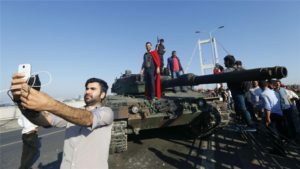 ISTANBUL – The Turkish government is expected to continue its crackdown on suspected putschists on Tuesday, while the US-based Muslim cleric accused by Ankara of orchestrating the coup attempt says he doesn’t fear extradition. Turkey has so far detained over 7,500 people and sacked almost 9,000 officials in its relentless purge of suspected plotters with President Recep Tayyip Erdogan vowing to wipe out the “virus”. Erdogan has blamed his arch-foe Fethullah Gulen, a moderate Turkish preacher living in the US, for being behind the attempted power grab that left more than 300 people dead, and has demanded that Washington extradite him. But the 75-year-old categorically denies any involvement in the plot and has suggested it could have been staged by Erdogan himself. “I have no concerns personally,” Gulen said in an interview with several media outlets including AFP in the Pennsylvania town of Saylorsburg he has called home since 1999 under self-imposed exile. 1. Coups are undemocratic and have no place in modern societies. What are the expected impact of coup to Turkish? 2. In psychological point of view,why some people withdrawn from modern society by doing coup? 3. What are the positive and negative effect of coup to Turkey with your country? 4. Does your country have a Diplomatic agreement with your country?